Quality vinyl and porcelain dolls. Gifts every woman or girl will treasure for a lifetime. Dolls so lifelike, you'd almost swear they were real! Heavy demand is expected for this doll! Order now! May smile and soothe it into rest, With all a Mother's fondest care. How sweet to feel its helpless form, Depending thus on me alone! And while I hold it safe and warm, What bliss to think it is my own!" Doll is 16" in length. This lifelike baby doll is the very FIRST So Truly Real™ collectible vinyl doll that "breathes"! Available for shipping May 2006, reserve yours today! There's no doubt that this sweet little baby girl is simply adorable! And when you see her wriggle and hear her contagious giggle, you'll be totally captivated. From the Wee Wigglers doll collection, the first So Truly Real™ realistic lifelike baby doll collection ever created that actually move, you'll enjoy watching Deanna come to "life" at the flick of a hidden switch! Fill your heart with laughter with this realistic baby doll by Master Doll Artist Olivia Stone, available exclusively from Ashton-Drake. 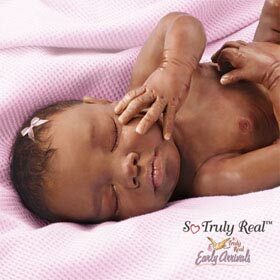 This collectible vinyl baby doll is amazingly lifelike, from her RealTouch™ vinyl skin to her wispy baby hair and carefully "manicured" little fingernails and toenails. Strong demand is expected, and you don't want to miss a moment - order now! Order now to bring her home! Doll is anatomically correct with RealTouch™ vinyl skin! Doll is approx. 15-1/2" long. Truly Real(TM) baby dolls, so don't wait. Copyright © 2003-2006 Excellent Doll. All rights reserved. Excellent Doll© is not a part of Lee Middleton Original Dolls®, The Ashton-Drake Galleries®, or Precious Moments® Company, Inc. In the hearts of those who love them, dolls live forever!